That street art persists in Chicago is a sort of miracle. 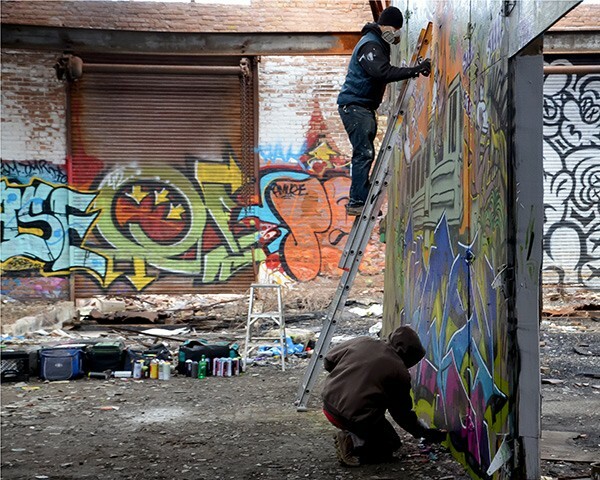 This is a city with a two-decade-old ban on spray paint, a town in which the Department of Streets and Sanitation will spend nearly $5 million in 2014 to dispatch two-dozen crews every day to paint over or blast pressurized water at pieces. As of the middle of June, Streets and San had removed more than 60,000 works this year. On top of that, Mayor Emanuel is pushing a plan to double the graffiti fine, from $750 to at least $1,500. Threats of sanctions and the relentless buffing program don't seem to deter the artists persistently throwing up new and interesting creations in a place where authorities and institutions greet the discipline with little but enmity, save a surprisingly strong Cultural Center show on the subject last fall. So resourceful are these artists that I recently caught a glimpse of a cluster of stickers placed inside a solar-powered trash can downtown. But the city's concerted efforts have helped nudge some activity from the sidewalks into a growing group of urban art galleries, where an artist can freely exhibit work—and, usually, get paid for it. Aldermen are ready to sign off on Mayor Emanuel's proposal to hike fines for illegal graffiti. A talk and exhibit at the Cultural Center put the city's love/hate relationship with tagging on display. Graffiti busters: Do these guys have the solution?